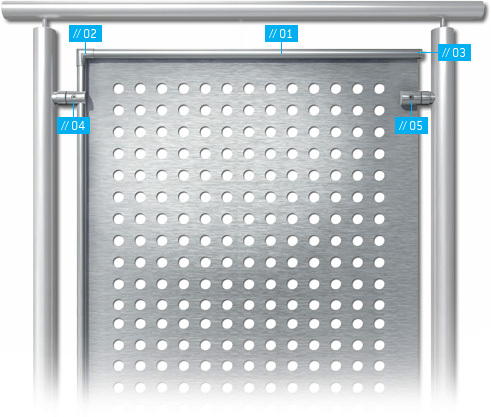 Whether it is expanded metal, perforated sheet or mesh: MEVACO has the right accessory. From profiled edging to corner connectors through to plate holders. Everything is compatible with our products in terms of size and material. Your mounting and connection solutions for safe and elegant assembly. Whether rectangular, round or trapezoidal – our profiles simply and securely edge expanded metals, perforated sheets, meshes as well as unperforated material. They prevent injuries and stabilise the filling. These are used to connect the individual profile edgings. Our end caps are ideal for neatly closing open profile edges. You can effortlessly secure the edged filling using this product. You can vary the distance of the profile edging to the object to be secured using the adapter. Perforated sheets and unperforated materials can also be quickly connected without profile edgings. You can vary the distance to the object to be secured using the panel bracket with adapter. Are you looking for fastening and connection solutions? Here you find the right accessories for expanded metal, perforated sheet or mesh. In different shapes and sizes, compatible with the product selected by you. Both in terms of dimension and material. For example, steel, Sendzimir-galvanised, aluminium or stainless steel. With our adapters you can also adjust the distance to the fastening object. At the banisters or handrails our accessories offer protection against injuries. They also open up a variety of interesting design possibilities. We have the right design for your desired shape and material. In steel, Sendzimir-galvanised, aluminium or stainless steel. Please choose your profiled edging. Fine zinc alloy or stainless steel cast alloy – we have the desired connector for you. Click here to go to our selection of corner connectors. Our profile end covers ensure neat and safe work. Simply search for the right model. The perfect fastening solution for framed panels. Choose a profile holder with or without adapter. Want a solution without a profile with direct plate attachment? Here you find plate holders with and without adapter for adjusting the spacing. Found your product or profile? Here you see the products which are compatible with your selection.